Hide deals from seller "Party Time Palace"
Hide deals from category "Laser Tag"
Limit 1 per person. Valid on 8 games of laser tag. May be used by multiple people in the same visit or during multiple visits by same person. All games must be used by Dec. 31, 2012. Promotional value expires Dec. 31, 2012. Challenge your friends to friendly combat with 51% off eight games of laser tag from Party Time Palace in Des Plaines ($56 value). You can redeem this deal over multiple visits, or you can use all games at once with a group of eight friends. Party Time Palace offers an entertaining variety of children's games and activities. Their arcade center offers the latest video games, and they also boast interactive inflatables, a kiddie train and a Chicago-themed 9-hole mini golf course. The 3,000-square-foot laser tag arena provides fun and challenging games in an urban-themed environment. 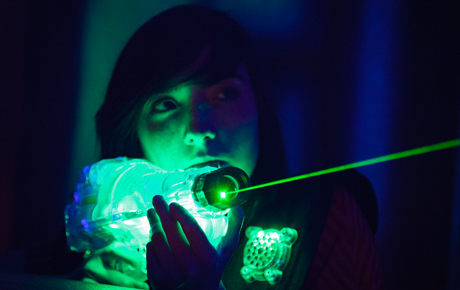 The multi-level arena provides beginners and experienced laser-taggers with fun, high-energy competition. Party Time Palace also offers party packages for memorable, one-of-a-kind children's parties. A children's entertainment center offering laser tag, arcade games, mini golf and more.